Awarded the Certificate of Excellence and ranked in the top 10 hotels in Rome by TripAdvisor, the Hotel Santa Maria Rome is a superior 3 star hotel situated in the charming district of Trastevere! Hotel Santa Maria Rome wanted to capitalise on their great brand reputation by selling directly through an Official website. Fisheyes designed a beautiful website to emulate the hotels unique style and installed our WebHotelier booking engine. Fisheyes then set up their channel manager which has been built to drive direct sales. 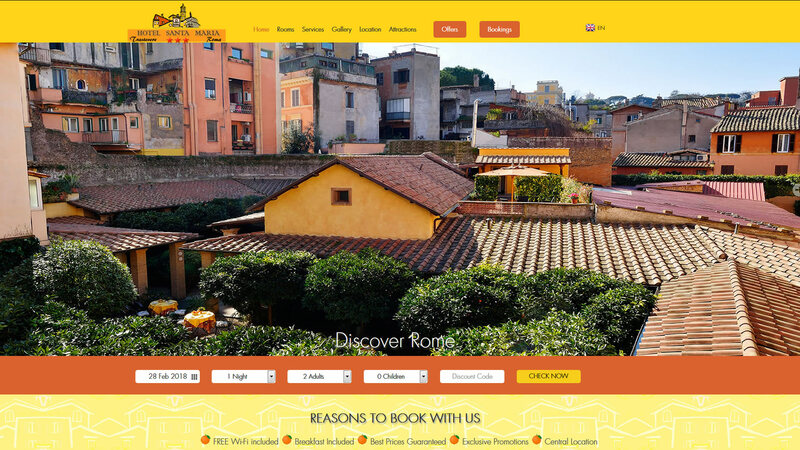 Hotel Santa Maria Rome began to use the special features on the channel manager along with the advice of their Fisheyes account manager, which resulted in massive increase direct bookings. Hotel Santa Maria Rome goal was to increase direct bookings and their expectation has vastly exceeded in the first year. The Hotel and Fisheyes have worked close throughout the year to achieve this massive transformation in direct sales. Fisheyes will continue to work closely with the hotel and advise them how to further increase their direct booking.